Exotics are one of the most sought-after items in all of Destiny 2, and for pretty good reason. In this Destiny 2 Exotics guide, we'll be providing you with a general overview for what Exotic weapons and armor items are in Bungie's FPS sequel. Should you need anything else whatsoever on Destiny 2 that isn't exotic related, including our complete guide to the brand new Farm social hub space, as well as mission and level walkthroughs like Homecoming and the Inverted Spire, head over to our Destiny 2 guides walkthrough hub. What are the bonuses of getting you're hands on the very best Exotic weapons that Destiny 2 has to offer? 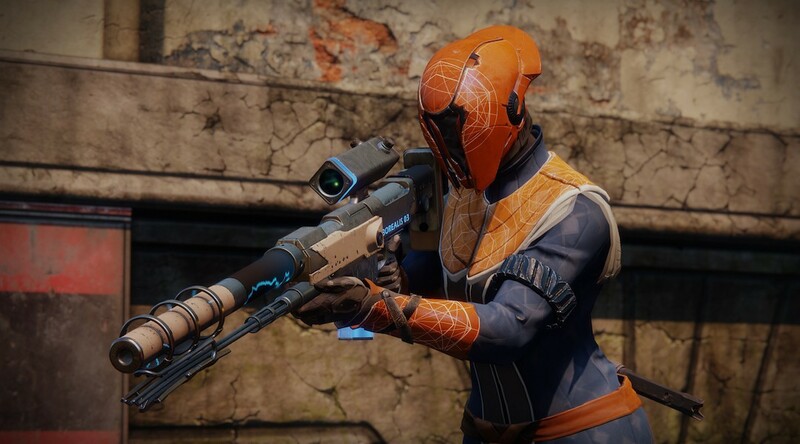 Other than boasting some of the best damage statistics in the game, Exotic items always come with added perks, bonuses that sometimes allow them to deal out extra damage, or reload weapons quicker. While the standard Destiny 2 level caps out at 20 (25 if you've got the Curse of Osiris expansion), there's also the Power level of your character to take into account. Whereas your standard level is increased by XP earned, your Power level is made up of your weapon and armor attributes, and peaks at Power level 305 (330 with the Curse of Osiris expansion). Simply put, you need to get your hands on the best Destiny 2 weapons and armor items in order to increase your Power level. It's nowhere near as complex as it sounds, but your Power level is fairly crucial to experiencing all the game modes that Destiny 2 has to offer, as activities like Heroic Strikes and the Leviathan Raid are locked behind a required Power level. Just below, you'll find our complete list of Destiny 2 Exotic weapons and armor guides. These guides will tell you exactly what the very best weapons and armor items are in Destiny 2, as well as detailing any character perks they come with, and where you can find them in the game. While each class, be it a Hunter, Titan, or Warlock, always has their own individual Super Abilities and subclass, they also have unique armor that the other two classes don't have access to. 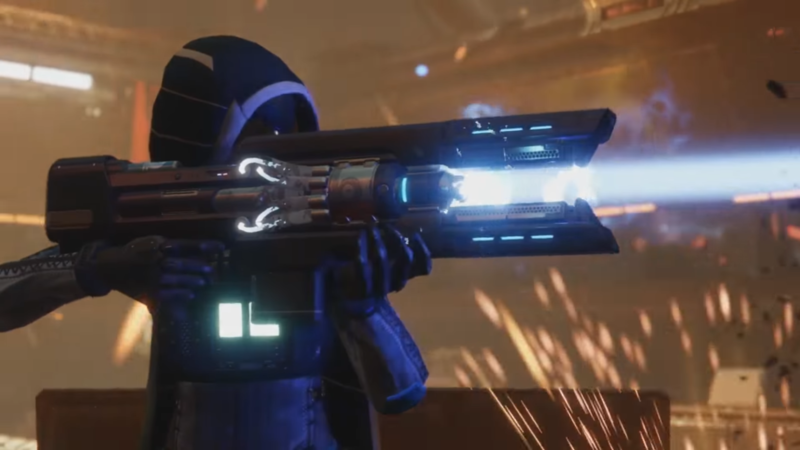 This isn't the case with weapons, as there are no class-specific weapons in Destiny 2, but there are class-specific armor pieces, including the Crest of the Alpha Lupi armor for the Titan, or the Ego Talon IV armor piece for the Warlock. Whatever the case, we'll be sure to denote any class-specific items whenever we come across them in our Destiny 2 Exotic items guides, so you don't waste your time chasing down an elusive item for the wrong character. 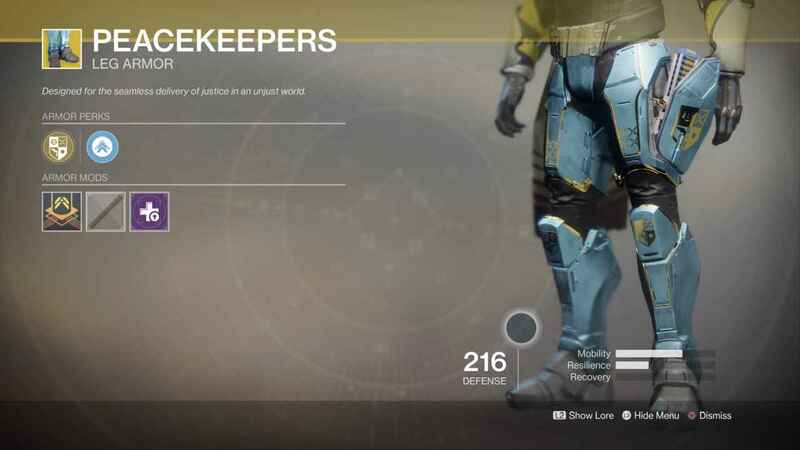 One item that you'll definitely want to be on the lookout for is the Peacekeepers Titan leg armor, one of the more powerful Exotic armor items in Destiny 2. The main reason that the Peacekeepers are so sought after is that they automatically reload stowed sub-machine guns, allowing you to ready them instantly and begin firing away. While the Peacekeepers are unfortunately only obtained through random item drops from Heroic Public Events or Milestone rewards, they're incredibly effective if you're wielding at least one sub-machine gun in any of your weapon slots, as you can basically switch between weapons on the fly after you've emptied the magazine of your other weapon. Remember that we'll always be updating our Destiny 2 Exotics guides with every new item that Bungie releases into the game. If the Curse of Osiris, or any other future DLC installments bring any new Exotic items into the game, you can be sure to hear about them here first. Make sure to check out the wealth of additional guides we have here on USgamer for Destiny 2, including our guide on how to beat the Leviathan Raid, as well as our full European Dead Zone guide. For a more visual look at exotics, check out the video below showing the best Destiny 2 Exotics you need to get your hands on. If you're ever unsure of which Exotic weapons are currently favored by the Destiny 2 community, it's a good idea to simply play a few Crucible matches. Through this, you'll notice which Exotic weapon items players often use, for example nearly everyone was using the MIDA Multi-Tool shortly after the launch of Destiny 2, denoting it as one of the best weapons in the game. First revealed by Bungie on November 29 as part of the huge improvements to the game, the new Masterwork weapon tier is largely an improvement over the Legendary weapon tier, when the update launches right around December 12. 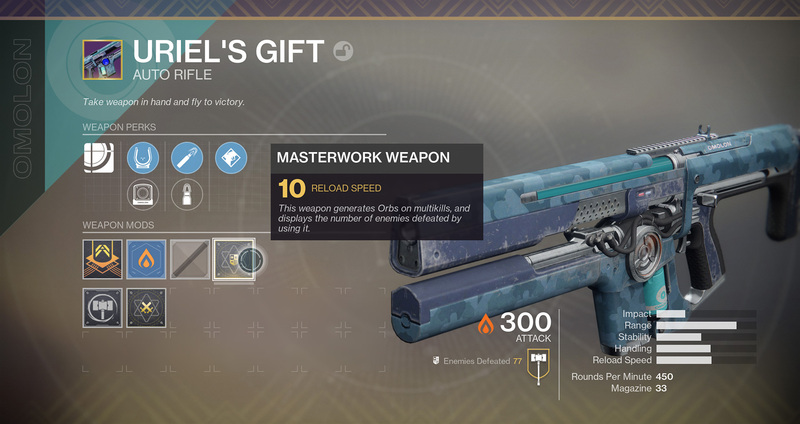 You can see a Masterwork tier for Uriel's Gift just below, which adds a bonus of 10 to the reload speed of the weapon. Aside from this statistical bonus between the Masterwork and Legendary tier, there will also be other bonus for the former. Masterwork weapons will generate orbs for you and your allies on multi-kills in the Crucible, and will also be able to track either your total kills with the weapon, or Crucible kills with it. We should note that the weapon bonuses that come with the Masterwork tier are actually random, and can be re-rolled from a small pool in Destiny 2. This is everything we have right now on the upcoming Masterwork tier for Destiny 2, but should Bungie release anything else about the improvements, you can be sure that we'll update our guides to reflect it. Make sure to check back on this post for all the new details about Destiny 2 weapons and armor that we can find, as well as whenever Bungie adds any new high level weapons or armor to the game.